Marisa picked out this photo for us this week over at Just Us Girls. Isn’t it just gorgeous!!! I would love to eat there for Thanksgiving…wouldn’t you? I don’t feel like I did this photo justice this time….so sorry Marisa! keep it clean and simple this time. Have you seen the Painter’s Tape Technique that is all over Pinterest and youtube? I however, learned it from my Stampin Up Rep last month…Thanks DEBBIE!!!!! I linked it up for you! It’s so fun and ridiculously so EASY!!! and the leaf is from Cloud Nine Design. 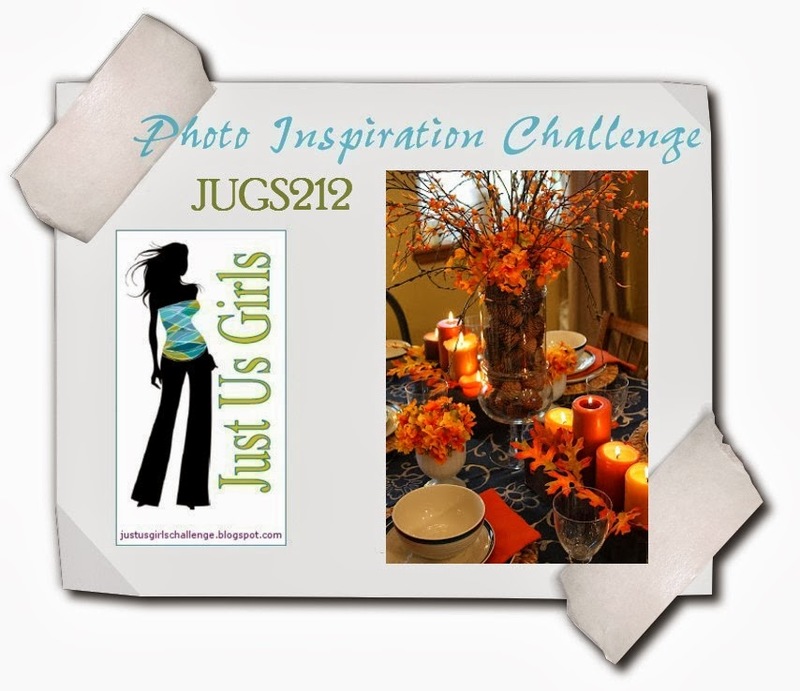 Now please head on over to JUGS and see what my teammates did with this gorgeous photo this week! Just a reminder that Just Us Girls is starting up the Guest Designer position once again!! Winning Chic of the Week puts you in the running for the GD spot. the JUGS girls will decide who the Guest Designer will be for the following month! I will be back tomorrow for a new CAS on Sunday! 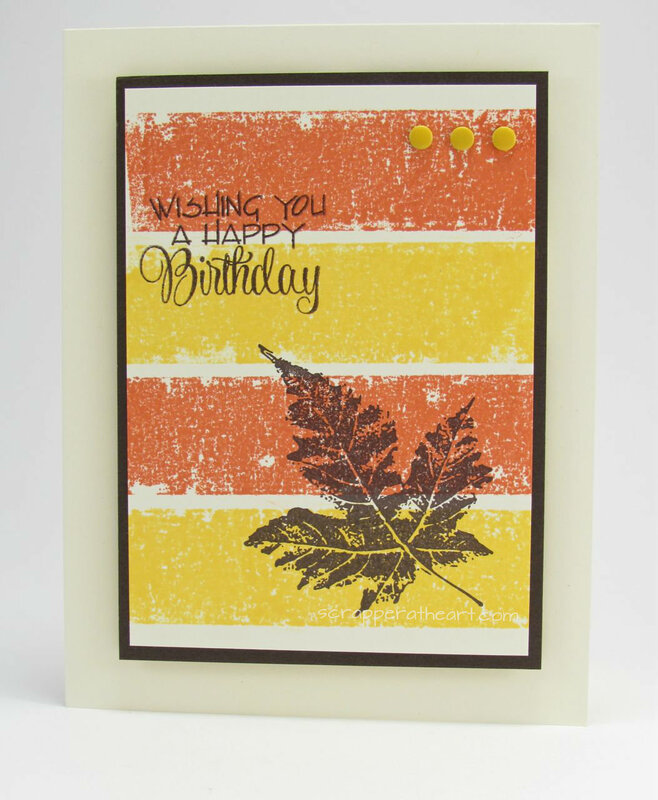 Categories: Cards | Tags: Card making, Cards, Happy Birthday, painter's tape technique, rubber stamps, stamping, Stamping Up | Permalink. I think your card is very pretty! I’ve never done the masking tape technique before, but I love the look of it on your card. I’m going to have to try it. Love the colors you chose and that great leaf. Hope you feel better soon! Hi Nancy, so sorry you are feeling under the weather. Hope you are feeling better real soon. I love your card with the painter’s tape technique. The colors are perfect. I have tried this before also and love the way it turns out. Lovely card, Nancy! Love the teqnique…it adds a lot of great texture to the background! I love this card. Nice and colorful but not so complicated. Great fall work of art. very cool CAS card and a good interpretation of the inspiration photo! I just saw that technique somewhere and have been meaning to try it out. Very cool! Love the look you created with it! Very pretty card! Nancy, that background is soooo cool! I have not seen this technique and can’t wait to try it out. The silhouette leaf looks great against that background. Feel better soon, Nancy! LOVE that technique on your Pretty card and the black sentiment and leaf are so striking against the stripes! I love the background technique! Great job the colors are fabulous!